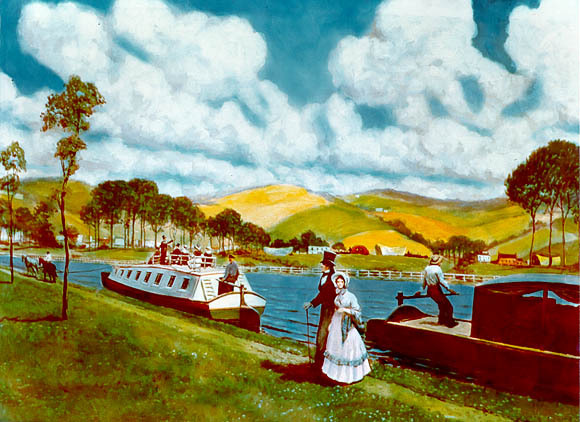 Erie Canal, NY (Feb. 27, 2007) - On May 16, 1987, Mid-Lakes Navigation Co., Ltd. of Skaneateles, NY, launched the first Lockmaster canalboat on the Erie Canal, introducing a new form of recreational boating to the venerable waterway. For the first time, American boaters could charter a vessel designed especially for their famous waterway and enjoy a week afloat discovering its unique history, culture and scenery. The story begins in the mid 1980s when Peter Wiles Sr., Mid-Lakes' founder, traveled to the canals of England on vacation. A long-time canaller himself, Wiles was captivated. While there, he encountered the hundreds of refurbished freight-carrying canal boats, called narrow boats for their 6'11" width, that now carried owners and renters comfortably across the country on thousands of miles of reclaimed canals. In November of 1986, Wiles took most of his family and his boat building foreman back to the U.K. to study the layouts, amenities and construction techniques for the planned new fleet and to learn first-hand the pleasures of English canalling. Once home, they got to work on the boats he called Lockmasters. The Mid-Lakes designs are shorter and wider for more efficient use of space on the larger canals of New York State. Wiles chose a rich red, green and gold pallet for the outside of the boats, and the aft hatches received the classic "roses and castles" - style artwork featuring the Lockport Locks. Inside, pine paneling with mahogany trim lined the interior, and a brass bell at the front door and braided rugs under foot completed the décor. All were equipped with galley, sleeping cabins, shower and toilet, heat and hot water, boating gear and everything else necessary for safety and comfort on the canals. Beyond the nuts and bolts (or steel and wood), Wiles brought home the notion that the journey is the destination, that cruising quietly at six miles per hour (inland waterways measure speed in mph, not knots) through the villages, woodlands and backyards was the essence of a relaxing vacation. The notion took hold and today, the Mid-Lakes fleet includes 11 Lockmasters that charter from their marina in the town of Macedon, NY, just east of Rochester. Armed with lots of information about the Erie and other canals, the charterers can choose their route, and take their time, along the way discovering a favorite local tavern, museum or eatery. And they'll bring home an appreciation of an old-fashioned mode of travel, now a 20-year tradition on the Erie Canal. For more information call Mid-Lakes Navigation, 685-8500, 800-545-4318.